Silvi and Phebe write "Once again it is my honor and privilege to tell you what God is doing in our small church. Last month we had nine baptisms, two of which were muslim converts. Praise be to the Lord. It is awesome to see people coming to Jesus from Hindu community and Muslim community. I am challenged to reach the Muslim people at any cost as they are not reached here in my town. Please pray for Lord's protection and His guidence. Thank you for your valuable prayers as they are making a great difference in reaching the tribal (gypsy ) people. There are hundreds of tribal villages without Gospel. God is opening new doors to reach more tribal villages." 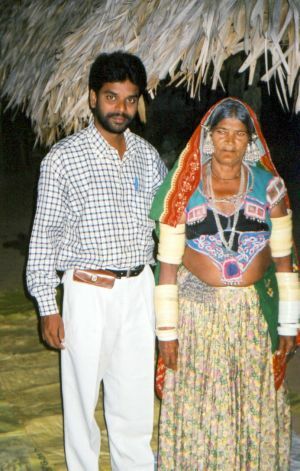 Photo of Silvi with one of the tribal women.